No matter what we’ve been led to believe, we CAN discuss God in the public arena, our children can discuss God in school, and we can display “In God We Trust” in our workplace, schools, and other public buildings. Our online store has items available as needed. Display a poster of In God We Trust in your classrooms. Purchase your poster here. Display a replica of the In God We Trust sign in the Congressional offices in your business foyer. Purchase wall hanging here. 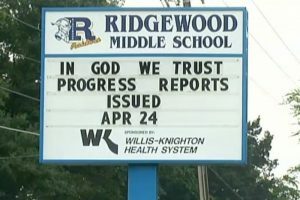 Display In God We Trust on your Church or business marquee. Encourage your city council to display In God We Trust in their chambers. Display Posters, Banners and Signs. Purchase at our online store.